An open letter to the President and Prime Minister of the Republic of Italy. Chinese President Xi Jinping is about to start his visit to Italy. We understand that China is an important commercial partner of Italy and trade agreements will be at the center of the meetings. Italy has consistently been a staunch defender of human rights in different contexts, and has repeatedly stated that human rights should be part of all bilateral negotiations. The situation of human rights in China is cause of serious concern in many respects. Our organizations specialize in religious liberty issues, and limitations of religious freedom in China are now worse than they even were since the Cultural Revolution. China allows only a few religious organizations controlled by the Chinese Communist Party (CCP) to operate, but even these groups are subject to limitations: for example, they cannot involve minors in their activities nor have any missionary outreach. 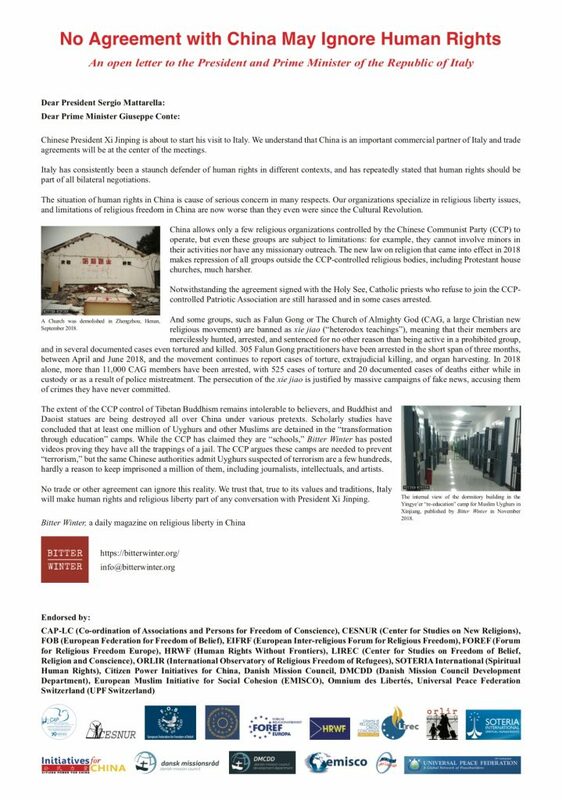 The new law on religion that came into effect in 2018 makes repression of all groups outside the CCP-controlled religious bodies, including Protestant house churches, much harsher. Notwithstanding the agreement signed with the Holy See, Catholic priests who refuse to join the CCP-controlled Patriotic Association are still harassed and in some cases arrested. And some groups, such as Falun Gong or The Church of Almighty God (CAG, a large Christian new religious movement) are banned as xie jiao (“heterodox teachings”), meaning that their members are mercilessly hunted, arrested, and sentenced for no other reason than being active in a prohibited group, and in several documented cases even tortured and killed. 305 Falun Gong practitioners have been arrested in the short span of three months, between April and June 2018, and the movement continues to report cases of torture, extrajudicial killing, and organ harvesting. In 2018 alone, more than 11,000 CAG members have been arrested, with 525 cases of torture and 20 documented cases of deaths either while in custody or as a result of police mistreatment. The persecution of the xie jiao is justified by massive campaigns of fake news, accusing them of crimes they have never committed. The extent of the CCP control of Tibetan Buddhism remains intolerable to believers, and Buddhist and Daoist statues are being destroyed all over China under various pretexts. Scholarly studies have concluded that at least one million of Uyghurs and other Muslims are detained in the “transformation through education” camps. While the CCP has claimed they are “schools,” Bitter Winter has posted videos proving they have all the trappings of a jail. The CCP argues these camps are needed to prevent “terrorism,” but the same Chinese authorities admit Uyghurs suspected of terrorism are a few hundreds, hardly a reason to keep imprisoned a million of them, including journalists, intellectuals, and artists. No trade or other agreement can ignore this reality. We trust that, true to its values and traditions, Italy will make human rights and religious liberty part of any conversation with President Xi Jinping.